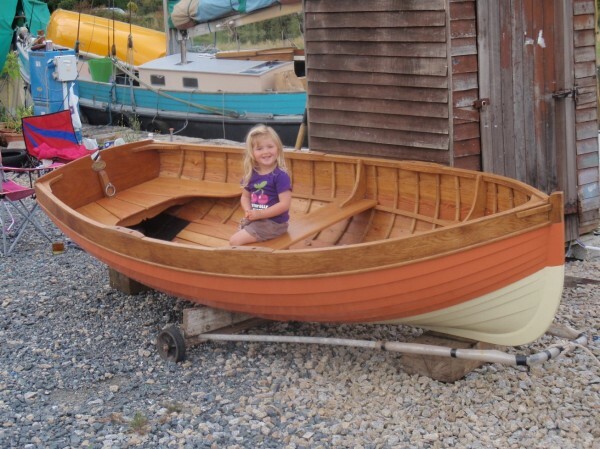 A brand new traditional clinker planked rowing dinghy by professional Cornish boat-builder James Baker, built to traditional, conventional methods of dinghy building in traditional materials. Planked in larch, 1o planks per side, all fastened with copper nails and roves to steam-bent oak timbers on an oak back-bone. Opepe transom cut with a sculling knotch. After seating, mid-ships thwart and fore thwart all in varnished larch and fitted with half-lapped oak knees. Half-lapped oak quarter knees and breast hook. Traditional clip-in loose bottom boards in scrubbed larch. The dinghy is finished in paint exterior with oiled sheer-strake and all oiled interior with varnished seating. Tarred bilge below the bottom boards. Brass D-section protection strip along the keel. Galvanised paynter ring inside the stem and through the transom. Sculling notch in the transom. Thole pins at mid-ships and forward thwarts to give dual rowing positions. Pair of varnished, leathered, straight blade spruce oars. A particularly pretty little pulling boat with good beam and volume allowing her to carry 4 people in safety. Full midships sections carried forward for buoyancy and stability and the sweetest tumble-home to the transom all combine to make this little boat everyone’s idea of what a proper clinker dinghy should be. And all at a very sensible cost. In building her, thought was given to future fitting of a rig so that it is very possible to install a dagger-board and box, the forward thwart already has a hole cut for a mast and a mast step can be fitted on the keel below and the transom and stern post were built with shipping a rudder in mind.